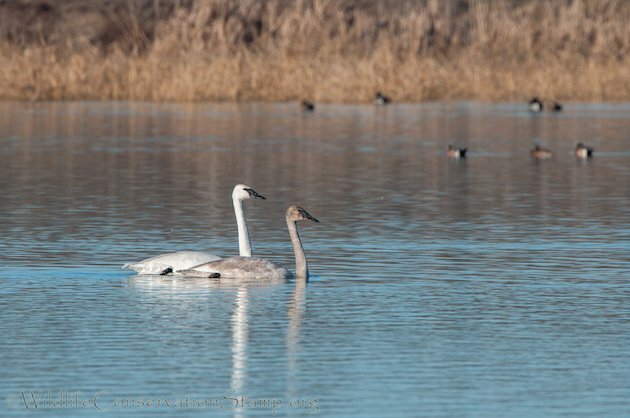 Following my local list serve I was pleased to read that there were two Trumpeter Swans (Cygnus buccinator), one adult and one immature, hanging out at the Chico Oxidation Ponds, about an hour and a half from my house. This being a life bird for me I had no choice but to take the drive. Click on photos for full sized images. The Trumpeter Swan is the largest native North American waterfowl, being five feet long, with a wingspan of seven to eight feet and weighing in at twenty-three pounds, they are hard to miss. 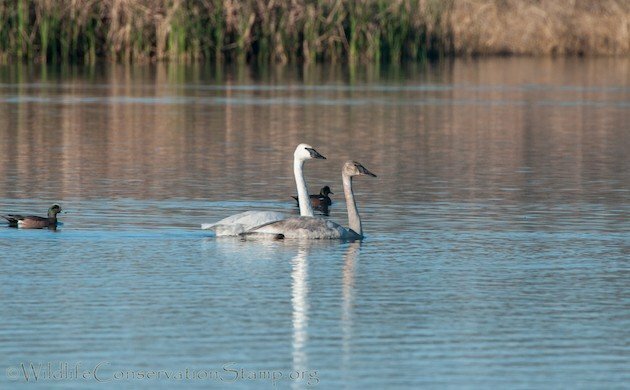 They are differentiated from their smaller cousin the Tundra Swan by their all black bill which has a straight ridge reminiscent of the Canvasback. The Tundra Swan usually has a yellow spot at the base of the bill and shows a concave culmen profile. 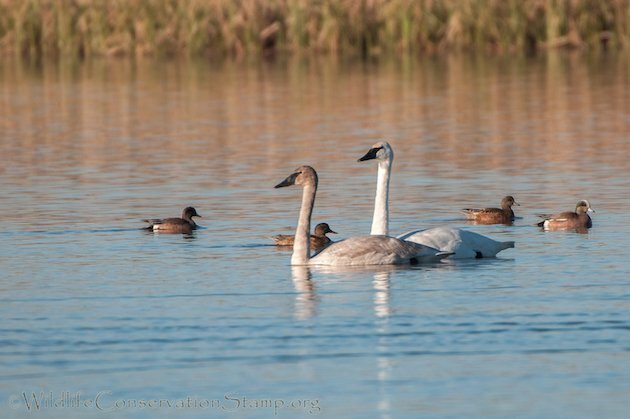 Although it was formerly abundant and geographically widespread, Trumpeter Swan numbers and distribution were greatly reduced during the early fur trade and European settlement of North America (1600’s to 1800’s), when it was prized for its skins and primary feathers1. 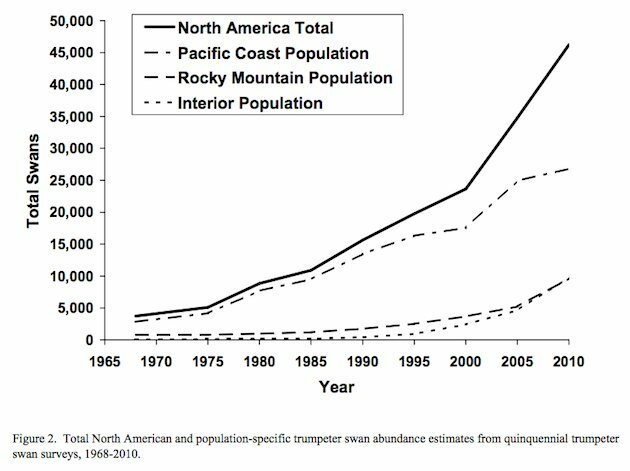 In North America they are divided into three populations for management purposes, not based on biological differences: 1) Pacific Coast Population, 2) Rocky Mountain Population, and 3) Interior Population. During the 1980s, the Pacific Coast Population swans became the source of eggs for several restoration programs in Minnesota, Michigan, Ohio, Wisconsin, and Iowa2. 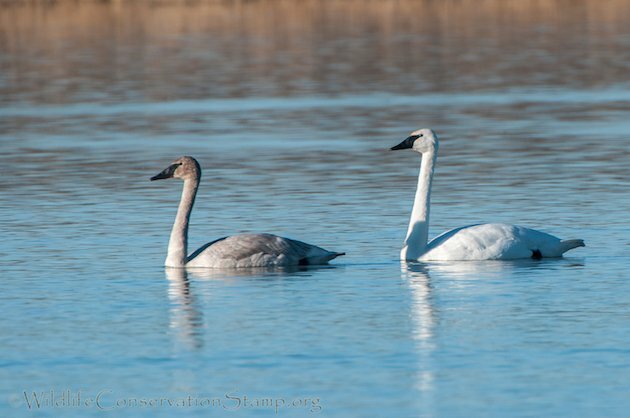 The North American Trumpeter Swan survey has been conducted approximately every 5 years since 1968 to assess the abundance, productivity, and distribution of Trumpeter Swans in North America. The good news is that these majestic birds have been increasing in numbers every year! The 2010 continental estimate of trumpeter swan abundance was 46,225, an increase of 33% since 2005 and the highest recorded since the surveys began in 19683. 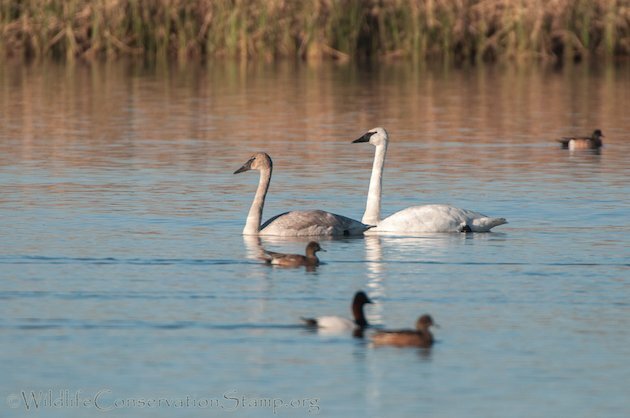 Since a Yellowstone National Park naturalist suggested in 1935 that Trumpeter Swan studies be conducted “before the species is extinct,” the species has responded well to most conservation and management actions. Trumpeter Swans continue to increase in numbers and distribution, which is cause for celebration. This video was taken at the Chico Oxidation Ponds where these swans were relaxing with hundreds, if not thousands of ducks. See how many different species of waterfowl you can see and hear! This past fall the Trumpeter Swan (& Tundra) was hunted (albeit in extremely limited numbers–no more than 10 total) by the Chippewa Indian tribes. The hunt took place in three northern states. Just an FYI. I live in Iowa and we have many nesting pairs in our state. Glad you added to your life list! “Yes, swans — trumpeter and tundra swans — those large white waterfowl that are as much a symbol of grace and beauty as they are of conservation success from the brink of extinction. The hunters will be members of seven Chippewa Indian tribes, and they’ll be allowed to hunt in any huntable waters across swaths of east-central Minnesota, northern Wisconsin and Michigan’s Upper Peninsula known as the ceded territories of 1837 and 1842. The two-month hunt, which has been approved by the U.S. Fish and Wildlife Service, represents the first legal swan hunt in the Mississippi Flyway and the first hunt anywhere where trumpeter swans can be legally killed — though the primary target will be similar-looking tundra swans. While the hunt is prompting unease, if not criticism, among some swan lovers, its federal approval serves as testament to the trumpeter swans’ comeback from nearly zero a few decades ago to perhaps 10,000 birds in Minnesota today. Interesting that George “Bird” Grinnell, in his 1901 writing “American Duck Shooting,” deemed Trumpeter Swan adults “very tough and hardly edible.” So why would anyone want to shoot them for subsistence? I asked myself the same question. My father has said goose tastes terrible and is very dry, I can’t imagine swan tastes much better. Perhaps the large amount of meat a swan affords compared to other waterfowl makes it more desirable? I suppose there must be a traditional reason these particular tribes want to hunt the swans. At the very least I would hope the hunters will utilize the whole bird and bless both the hunt and the birds they manage to take. And somewhere, E.B. White is smiling. 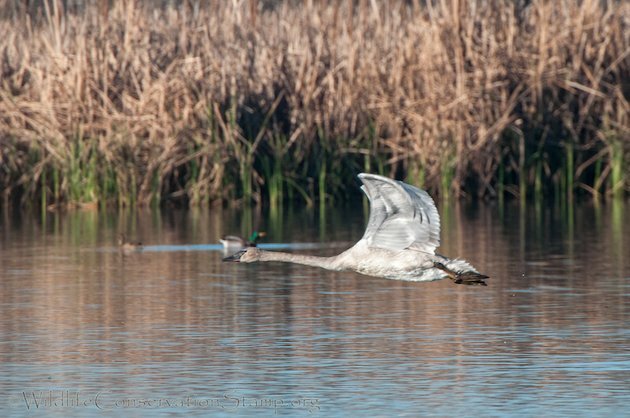 A pair of Trumpeter Swans sure surprised us down here in Tucson, AZ yesterday when they showed up at Sweetwater Wetlands! I was lucky enough to see them, a lifer for me. Unfortunately they were not seen today. There are only 5 previous records in the state. Congrats Jeremy! Awesome bird eh? I am glad to here about the swans, but I must state some facts about Ruby Marsh National Wildlife Refuge. Barrick mine that is eight miles away continues to poison the water. Smaller species of birds are decreasing in number. fish are dangerous to eat, see Nevada Department of Wildlife Hazerdous water page, and this is a closed water system. What does this do to the birds who eat fish the mine is currently asking for a 19 year expansion. I don’t think the marsh will make it. Sandhill Crane Hunt in Kentucky? !